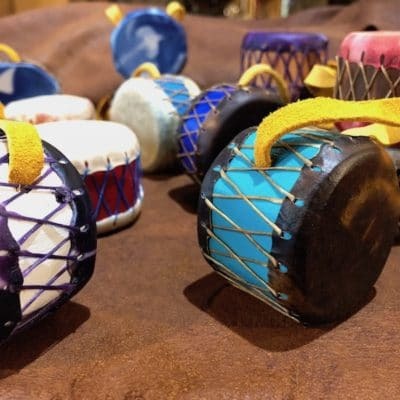 Tribal Spirit Black Bear Shakers are made with steamed White Ash wood body/shell covered with Bear Rawhide, maple handle with bear fur. These shakers have very strong tones with lots of variety. For a strong sound, shaking the beads across the rattle striking the ash inside the tone is quite loud and dramatic. Shaking the other direction hide to hide it is much softer and subtle, while holding the shaker flat and rolling the beads around the surface of the rattle creates a wave/ocean effect. These shakers will be just amazing in the sweatlodge. 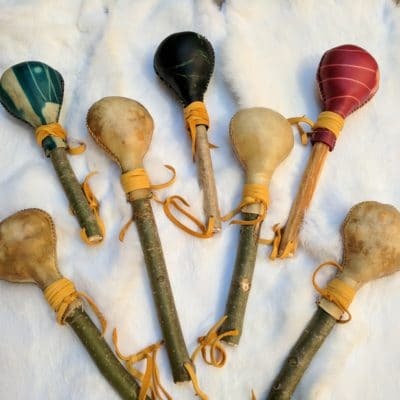 Tribal Spirit Moose Hide Rattles are made with a maple handle and a moose hide rattle head in either natural or dyed. This is the first time making this style of rattle and we are very excited with the results. These shakers will be just amazing in the sweat lodge. We used only the thickest of moose hide and they won’t go flat/soft. Rattle Kits!! Brand New by Tribal Spirit. Everything is included, so that a great time is had by all. 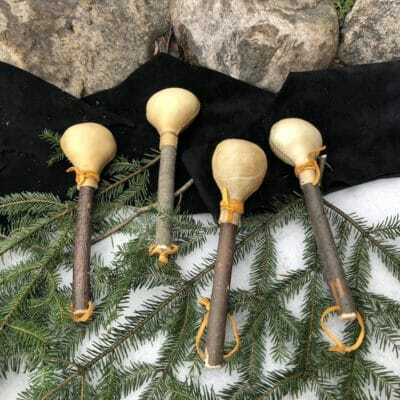 We are offering a Deer or Moose Rattle Kit. 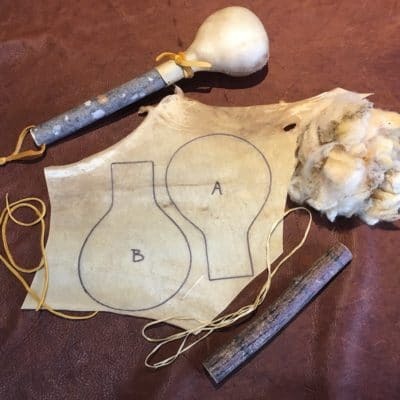 Each kit comes with a carefully selected piece of rawhide (shape traced out to be cut), glovers needles, sinew, maple wood handle and wool to stuff and shape the rattle. 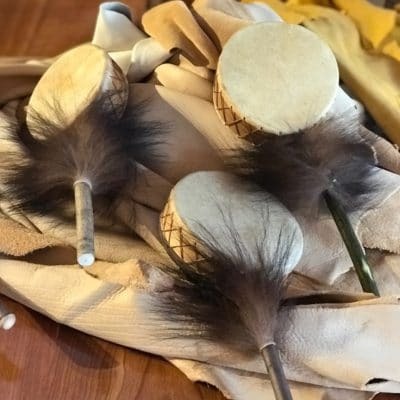 Tribal Spirit Moose Hide Baby Rattles are made with a maple handle and a Moose hide rattle head. The heads are double sewn, so nothing will fall out! This is the first time making this style of rattle and we are very excited with the results. Available in natural hide only. 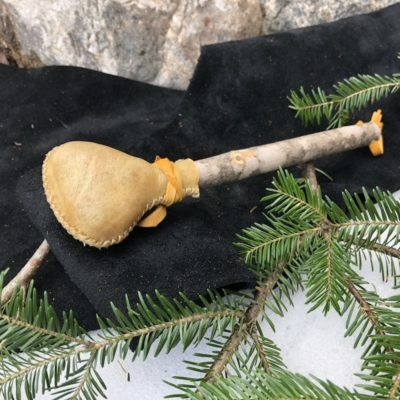 Tribal Spirit Deer Hide Rattles are made with a maple handle and a Deer hide rattle head. Not designed for sweat lodge but perfect for accompanying drums in a circle. Available in natural hide only. 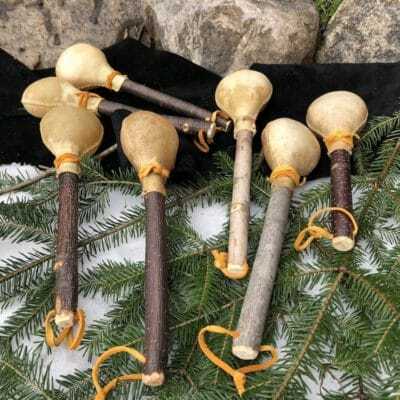 Tribal Spirit Bear Hide Rattles are made with a maple handle and a Bear rawhide rattle head. The heads are double sewn, so nothing will fall out! This is the first time making this style of rattle and we are very excited with the results. Available in natural hide only.